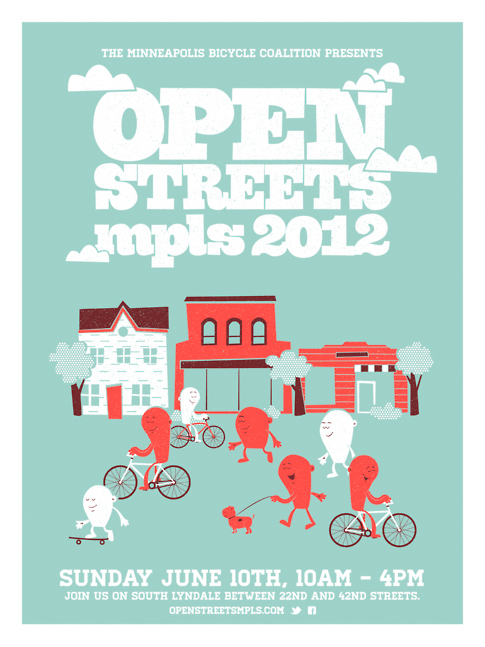 It’s time once again for Open Streets Minneapolis. If you are unfamiliar, it’s what you’ve always wanted – a chance to enjoy an easy cruise down the middle of the street on your favorite bike without getting yelled at by enraged motorists. The first year was a great success with all kinds of activities sponsored by local shops and popping up spontaneously in the road. Get there right at 10:00 a.m. for the Brompton folding bike race. Hope to see you June 10th, 2012 from 10:00 a.m. – 4:00 p.m. along Lyndale Ave S from 22nd St to 42nd St.
As the cool poster by Modern Climate indicates you can also walk or skate but really, cycling is where it’s at. Portland may have temporarily recaptured the top spot as most bikable city but everyone knows Minneapolis is hot on it’s trail. 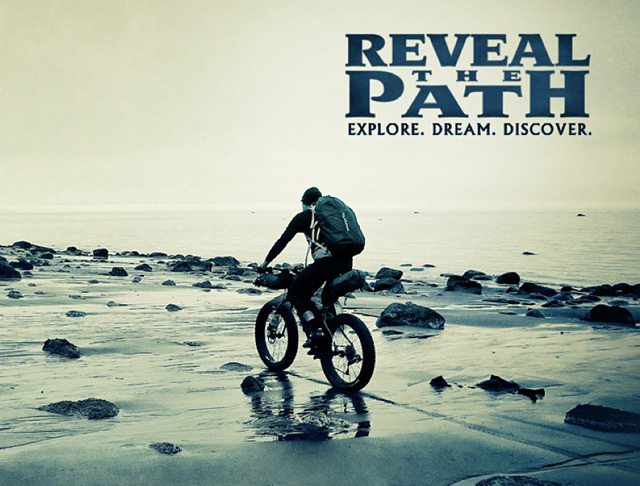 Perhaps that’s one reason Salsa chose Minneapolis for the world premier of the new epic bike adventure movie “Reveal the Path – Explore. Dream. Discover.” Show your cycle pride and ride over to the Riverview Theater Thursday, May 31st at 7:00 pm or 9:00 pm to catch the only showings and meet some of the team that made the film. See ya there! Just finished my first glow-in-the-dark screen print. It’s entitled “10-31” which will make more sense if you look at it sideways. At 13×13 inches it’s a small poster printed in a small limited edition on super black Skin 100 lb. cover from Curious Papers for the upcoming Scary Ink! poster show at Big Table Studio. There will be a big opening reception and sale on October 29th. I’ve heard costumes are encouraged. Hope to see you at the studio: 375 Wabasha St N., St Paul, MN 55102. There are a few posters left. Drop us a line if you’re interested. Cindy and I (aka BrainstormOverload) were delighted to be able to attend the Eyeo Festival in Minneapolis June 27-29, 2011. The presenter and attendee list was stuffed with big thinkers and doers from around the world and Minneapolis can be proud to have been the destination for this awesome data visualization pilgrimage. The sold out show clearly blew the minds of all 350 attendees, probably the minds of the building’s regular tenants and in all likelihood the minds of any students who inadvertently strayed too near the McNamara Alumni Center. In fact* even dogs as far away as Lake Nokomis are said to have been so inspired they scratched insistently at the computer keyboards of their owners in a vain attempt to create something beautiful and useful. There was so much beautiful and useful in evidence that I can’t possibly do it justice here. No worries. I’m sure someone who ignored his or her parent’s advice and became a jounalist will manage to do it. Here instead are a few links and references mentioned durring the conference to start your exploration into this burgeoning discipline that is at once both design and code. Nicholas Felton who summed up his work as “Telling larger stories with fewer words.” shared the obsessive process behind his beautifully designed, personal annual reports. He’s accepted a position at Facebook and I hope it entails him redesigning the UX from top to bottom. On the way to Facebook Nicholas created Daytum as a way to collect your own personal data. More is on my mind but my mind is actually starting to bleed which causes the synapsis to misfire so I’ll add more after I give it a rest. The cold and wet spring evening didn’t dampen the spirits nor it seemed the attendance at the Artisan Activist Poster Show last night at the Aveda Institute in North East Minneapolis. There was a terrific variety of creative expression, printing techniques and even some cool creative reuse of paper that was in perfect keeping with the Earth Day celebration. I was surprised how many prints were not signed and numbered (meaning that technically they’re not limited editions). Just the same, there seemed to be a steady stream of eager purchasers so the Audubon Society should receive a solid donation which is after all the point. We came away with a lovely letter press print entitled “Nest” by Selina Larsen. Speaking of point my lovely wife who is standing in front of my print seems none the less to be pointing at something else… hmm. Update: There are still some posters left which can be purchased here. Seems like there are always a couple of cute kids at poster shows.